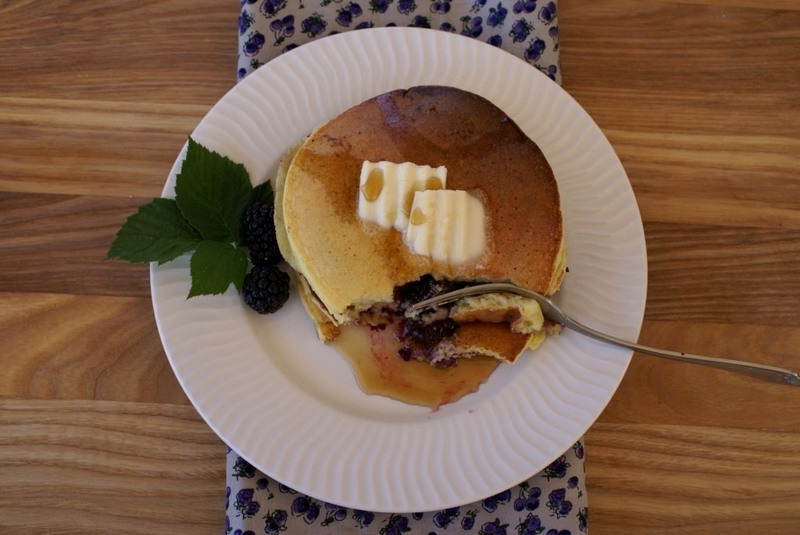 Pancakes: Once you go ricotta, you’ll never go back! 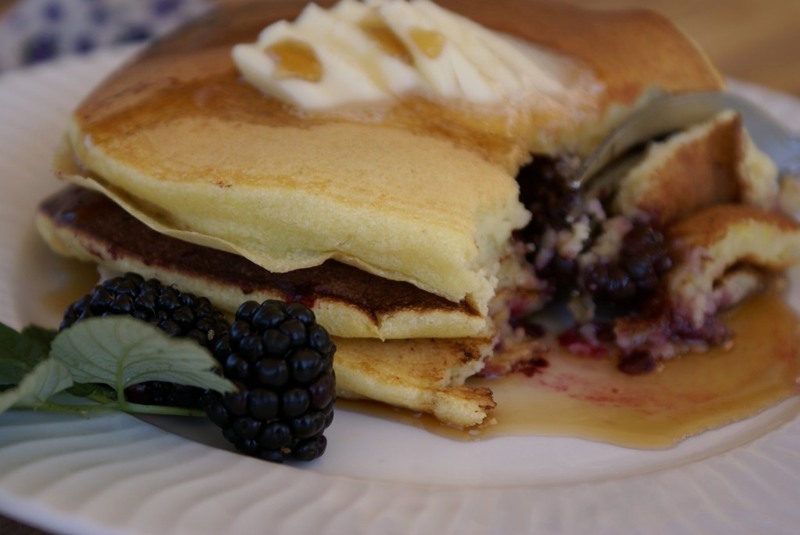 I have never been a big fan of pancakes… Since I wasn’t born in the USA I didn’t grow up having pancake breakfasts, I didn’t know what maple syrup was, I just didn’t know they existed at all. My first experience eating real American pancakes was quite some years ago at a classic pancake house during breakfast with some coworkers. I remember quite well I ordered pecan pancakes and coffee that morning. They looked fabulously stacked with the butter on the top and maple syrup dripping from the edges. I enthusiastically dug in, but to my disappointment they somehow tasted like dish-washing detergent… and I am serious when I say this! It was such a let down! I tried to finish them taking big gulps of coffee to flush them down. That first experience somehow just got me into thinking that I should never eat pancakes again. Luckily, in years to come I have had some great pancakes at friends’ homes, homemade and all yummy, but I still didn’t have the courage to try to make them myself. Since my daughter is a big fan of pancakes I’ve made them for her a few times and they’ve turned out OK, but still for me that wasn’t it. Practicing and experimenting with ricotta, I managed to come up with a recipe that totally suits my family’s taste buds. 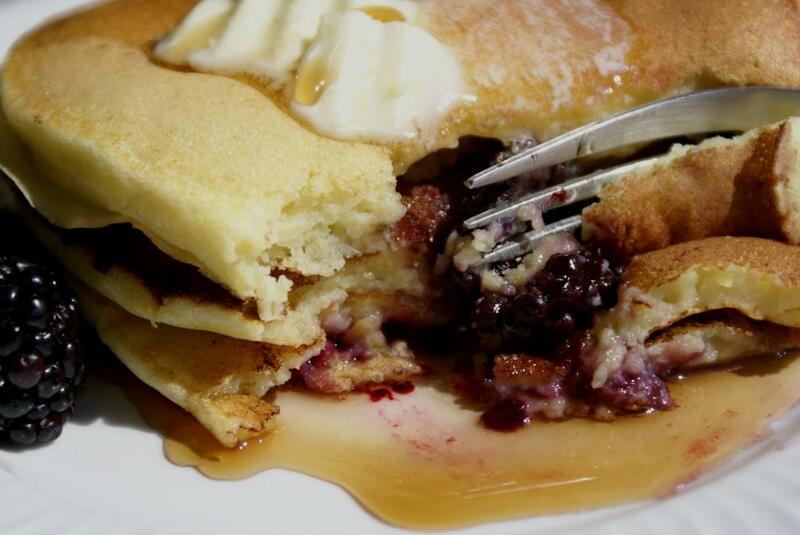 The batter is so light and fluffy, the pancakes are airy and just sweet enough. Adding some berries to it, just further enhances the taste! I will say it again: Once you go ricotta, you’ll never go back!!! Divide the eggs. Beat the egg whites with a pinch of salt until fluffy. Set aside. In one bowl whisk the egg yolks with vanilla, add ricotta cheese, milk and lemon zest and mix until combined. In another bowl combine flour, baking powder, sugar and a pinch of salt. Add the flour into the egg mixture and mix until smooth. Fold in the egg whites and lightly mix by hand just until combined. Batter will be very fluffy. Heat a griddle or a pan, butter lightly and using a small ladle pour the batter onto it. 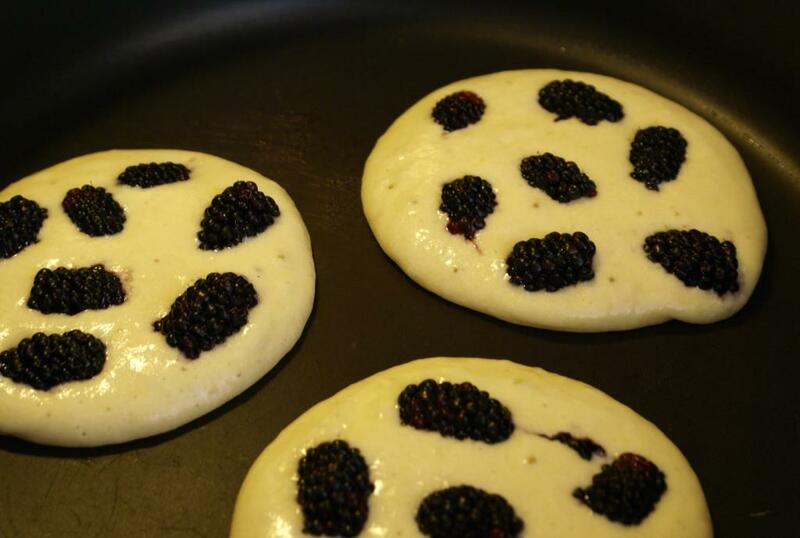 Add a few blackberries on each pancake and bake on each side for a minute or two until golden-brown. Serve with butter and maple syrup. Yum, yum, yummm! Once again it looks amazing!!! I walked by your house today but I had the dog so I didn’t stop!!!! I’ve never been a big fan of pancakes, either. They usually are heavy and last in your stomach forever. But these look just as you describe them – light and fluffy. Especially with the berries. Dear Sibella, It takes courage to keep trying to find the right taste when you’ve an initial bad experience. So, good for you. And, now, good for us! What milk did you use–skim (low fat), 1%, 2% or whole milk? BTW, your pictures are wonderful. Hi Kathleen, thanks so much! 🙂 I used 2% milk, which I usually use in our household. This looks wonderful. Thanks for sharing the recipe with us. I will have to try it soon. Hi Mary Ann, Thank You for visiting and I am always happy to share! 🙂 Wishing you a great week! I loved seeing the little embroidery pieces and your sewing in your last post. Love that kind of projects! I am now knitting a baby blanket for a friend’s new born..
Hi Sibella, the pancakes look wonderful and so mouth-watering! I think I have a similar recipe like yours! Hope to try it out soon 😉 I’ve nominated you an award at http://foodismylife.wordpress.com/2012/07/31/re-bake-jamie-olivers-easy-chocolate-cake-and-an-award/ hope you like it! Thanks you so much Jasline! 🙂 You really brightened up my day! I have two other awards that also have to brag about and thank people who have nominated me! THANKS AGAIN! HAPPY BAKING! I ALWAYS ENJOY VISITING YOUR BLOG! Wow, these look heavenly! What an amazing site you have! I’m excited to browse through it. Thanks for liking my blog post today! I’m sorry I have out of touch, Sibella.I been pretty much off-line until recently. 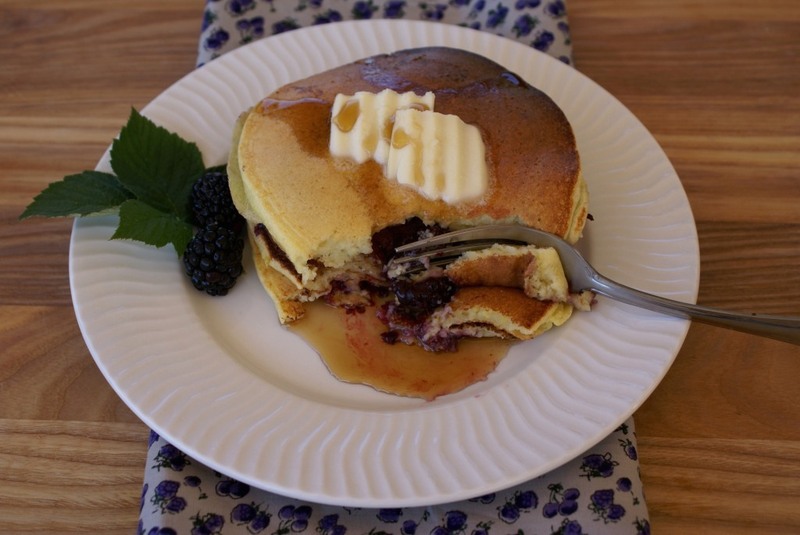 I love these pancakes and the other recipes I have taken a peek into. I am trying to find my blogger friends again. I hope all is well with you and that I see more of you wonderful recipes.